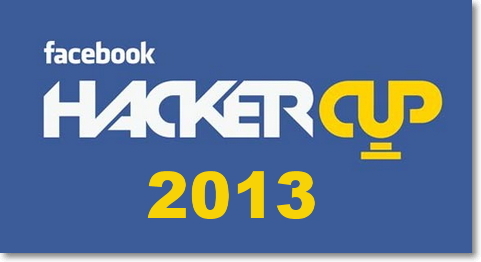 Social Giant invited hackers from Worldwide to register for Hacker Cup 2013 competition. The Facebook Hacker Cup is an annual worldwide programming competition where hackers compete against each other for fame, fortune, glory and a shot at the title of world champion. The first place winner will get $10,000 (USD), $2,000 (USD) for 2nd and $1,000 (USD) for 3rd place winner. And also all the winners will receive official Facebook T-Shirts. The Competition starts on January 25, 2013. This is qualification round, if you selected in this round Facebook will notify via Email for next round. Online Round 1 starts on February 2, 2013 at 10.00 PT. Online Round 2 starts on February 9, 2013 at 1:00 PM PT.